Let me start off by telling you what Bunny In the Basket is. Your Bunny in the Basket is sent from Peter Cottontail himself. He shows up at your doorstep! Why you ask!?!? Its the Bunny's job to watch over your children and report back to Peter how they are doing, your kids want to be good so they make the special list. He also comes with his own book! My kids love him! They went crazy when I explained what he was. 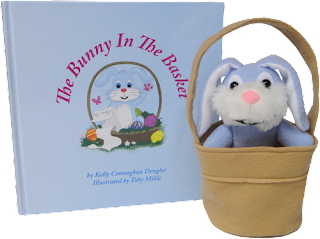 I told my little guy once I read the book our Bunny is filled with Easter Magic and at night when we go to sleep he comes alive and moves around our house. So each night when my kids go to bed I take our Bunny and move him to a new place. Every morning my kids run around trying to find him. Its so much fun! The first night we had him my kids were being naughty in the tub. They made a huge mess and dumped all my hubby's body wash. So that night when they went to bed I took the Bunny and stuck him on top of the cabinet above my toilet. The next morning my kids went to brush their teeth and both had equal looks of surprise on their faces. I told them the Bunny must have known they were misbehaving. My Bunny has shown up many places. My kids love it and he has become a fun Easter tradition already. I have read the story to my kids several times and they keep asking to hear it again. I love all the colorful illustrations. The books is so heart warming :). And there is a place in the back of the book to name your bunny! My kids named their Bunny Jack Cottontail. Bunny in the Basket really puts the magic back into Easter. He put huge smiles on both of my little guys faces. I love that I was given the opportunity to review this with them. The Bunny In the Basket is made in the USA. And 1 Simply Me reader has the chance to win their own Bunny!! Disclaimer: I was given the above product for the purpose of review. I was not paid in any way to write this review. All opinions are my own.